(or scroll to bottom of page to view it). 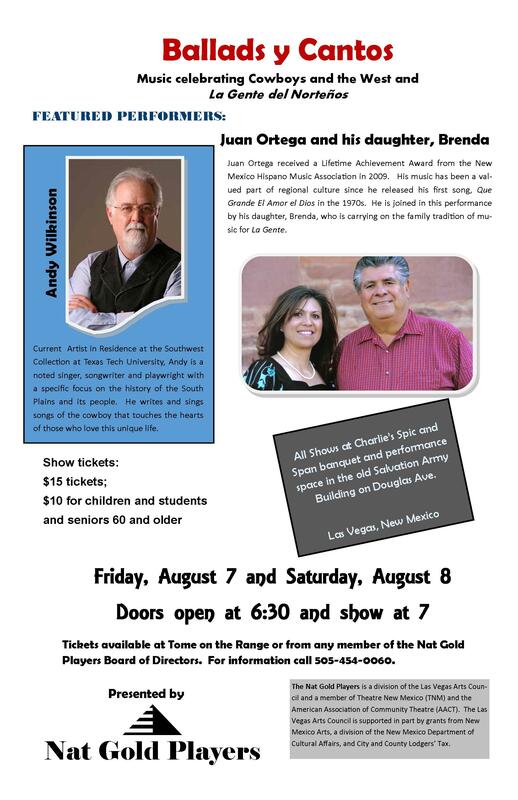 Nat Gold Players continues a long-standing tradition of community theatre in the ORIGINAL Las Vegas in northeastern New Mexico. At one time, this Las Vegas was a performing arts center for the entire southwest with accounts of community theatre groups as far back as 1870. Todays efforts began over 15 years ago with a fledgling Las Vegas Community Theatre Company, later named in honor of Nat Gold, one of the key founders, not long before his death. Nat Gold Players strives to provide quality performing arts relevant to the people of San Miguel and Mora Counties in New Mexico. The quality of their efforts is apparent in their selection to represent New Mexico at the 2015 Region VI AACTFest (including a five state region) for their performance of “Sheltered Women,” an original script by local playwright Kayt C. Peck. The mission of Nat Gold Players is to educate, entertain and involve the community in a unified effort for the performing arts, including but not limited to drama, musical and related cultural productions. The Las Vegas Arts Council is honored to be fiscal sponsors for this talented and dedicated group.